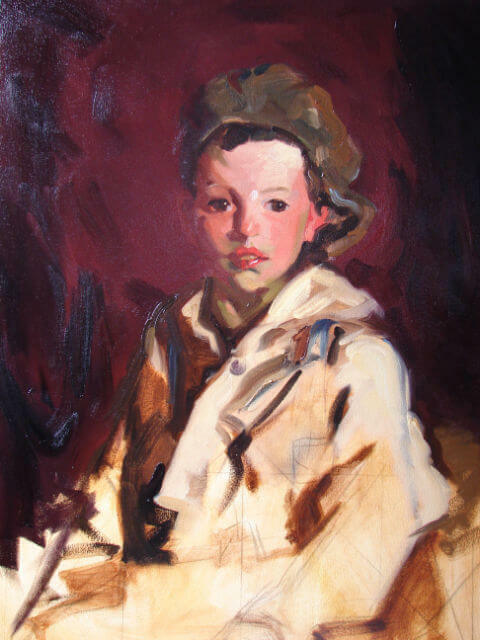 In my last blog post, I spoke about Robert Henri’s late Irish portraits of children. In the last series of portraits at Corrymore, 1927-1928, Henri focused on a new way of expressing color that was authentically his own drawing from his passion for extensive research and experimentation. Over the course of his painting career, Henri constantly experimented with color theory. He adapted various palettes from the early “triangular palette” (Winter’s studio) to the “Chord Palettes” by H.G. Marratta, to the color temperature/value palettes of Denman Ross which included his extensive “Ruben’s Palette” to the”Permanent Palette” and back again to the “Chord Palettes”. In 1927, Henri develops a palette that culminates all of his studies- a palette titled “3 or 5 Set Against the Complement“. This takes a limited range of colors and faces them off of the direct complement. In previous palettes he uses a near complement rather than a direct complement allowing for the intensity that a complement gives without the possibility of complete neutralization. But even in these new palettes, Henri forgoes neutralization and instead places the complement in a field of color. This palette of “3 or 5 Set Against the Complement” takes much of its effectiveness from years of working with Marratta’s “Chord Palettes”. Henri seeks the same over-all color harmony combined with an intensity in the colors. If the intervals between the colors forms a harmonious whole, than one can allow those colors to pretty much stand on their own. These colors form such a unity that one can directly stand them together without adulterating the colors. But if one is painting in a realistic or naturalistic mode than there are requirements on the colors to not just be beautiful together but also to convey the form and color temperature accurately and with subtlety. In many ways, Henri comes full circle. These late portraits are subjects illuminated by a single natural light. These figures emerge out of a darkened space, yet a space full of color. They are singular people with emotions flowing between artist and model. These are not the early black/brown backgrounds from his youth where the ideas of Whistler dominate his work. These paintings are sprung from a life of intense meditation on color, paint and subject. What creates the feeling of unity in these paintings is that the palette is almost primarily built on colors that are in close proximity to one another. In fact, they are side by side on the color wheel and they act as a foil in which a complement stands alone and by such contrast seems to emerge out of a well of color that directly intensifies it. The unity of the colors radiates from a single complement. “Radiating Intensities” was a term Henri used earlier in his career to explore the dramatic effect of a color taken from its most intense saturation and slowly moving out from this central point diminishing in intensity as well as value. This has the effect of a candle illuminating a room where as one gazes slowly away from the light source the color as well as the value decreases until there is utter darkness and total neutralization. In this palette of “3 or 5 set against the complement” Henri combines these studies with a sense of a chord. This is the palette, although it was laid out with the blue at the bottom of the palette opposite the Scarlet Vermillion. Additional colors used sparingly for the dark hair and dark eyes, a touch in the background- Black and Burnt Sienna combination. He also added Mars Violet rather than using Ultramarine to the Cadmium Red #4. Finding the same colors was very difficult as companies change the names of pigments all the time. The most difficult color to match was the Scarlet Vermillion. This was an incredibly intense orange that had more depth to it than a cadmium which appears flat in an orange. This was the most important color as it was used primarily for the flesh tone. He also used Zinc White to lighten the flesh tones. The painting was beautifully harmonious. The color of the painting hovered in the orange zone with the only accent of pure blue in the boys suspenders. It radiated warmth, life and an inherent vitality that only a master could achieve- truly inspired from within and without, capturing a child’s innate love of life. The bond between them forever present for us to experience. Fantastic discussion of color theory and Robert Henri you have here! Henri is one of my favorite artists – I’ve referred to him on my blog as the last of the old masters – and I’ve been looking for information about the pigments he used. The pigments you listed above – is that information taken directly from Henri’s notebooks? I painted this copy of “Johnnie Manning” at the Yale Art Gallery. I was able to use the studio of the conservator, Mark Aronson because this painting is never on display. So Mark was kind enough to pull the painting out of storage. I also knew that Henri coded each piece on the back of the canvas in bold paint. When “Johnnie” was pulled out of storage, there was a backing on it and the code was not visible. Mark took the backing off, and sure enough, there was the code. I took the code to the archive and matched the personal notes of Henri to this code. Henri kept a record of every palette for every painting with samples of the color choices. So Yes, these are the exact pigments he used. Although, I have to remind you that the names of pigments are arbitrary with the manufactures. It took me quite a bit of time, as I said, to find a match for the scarlet vermilion. But, I will have you note, that this palette he used for several paintings, but in no way was this his only palette. He varied his palette every several paintings or every painting. His variety of color was vast. Thank you for your response, Judith. I understand your caveats. I hope I can contact you at some point with more questions about the pigments Henri used. As well as I’ve been able to discover, ‘scarlet vermilion’ was usually a convenience mixture of vermilion and carmine. Your copy, by the way, is outstanding. I PURCHASED THE ‘ART SPIRIT ‘BOOK BY ROBERT HENRI IN 1955.ONE OF THE CHAPTERS WAS HIS THEORY OF COLOR EXPLAINING THE ABSENCE OF COLOR.SINCE I LOST THAT BOOK I BOUGHT A NEW EDITION AND THAT CHAPTER WAS ABSENT FROM THE BOOK.CAN YOU ADVISE ME WHERE TO PURCHASE THE OLD EDITION OR EMAIL ME THAT CHAPTER.